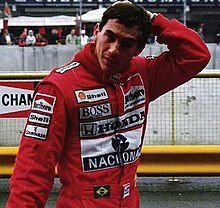 ↑ 1.0 1.1 Up until 1990, not all points scored by a driver contributed to their final World Championship tally (see list of pointscoring systems for more information). Numbers without parentheses are Championship points; numbers in parentheses are total points scored. หน้านี้แก้ไขล่าสุดเมื่อวันที่ 17 พฤษภาคม 2559 เวลา 17:15 น.